Addaia is a sheltered fishing and sailing port on the north east of the island, renowned for its beauty, beaches, scuba diving and bird watching with many country walks and cycling trails clearly signposted. Addaia is an attractive area of quality residential properties built around a smart marina, home to private yachts and with one of the best sailing schools in the Mediterranean just 15 minutes away in Fornells. Addaia has a small parade of shops and restaurants as well as a small tapas bar and restaurant on the harbour overlooking the water. A scenic coastal footpath wends its way around Addaia with spectacular views out to sea and over to nearby Macaret. For those who like a little more life, the lively resort of Arendal d'en Castell is approximately 2 minutes by car, with its 650m of sandy beach were you will find a beach bars and restaurants. If you like seafood, a trip to Fornells is a must! There are several quiet beaches worth visiting, some easier to get to than others! To the east is S'Arenal de Mongofre Nou with its sandy beach, accessed by driving through Mongofre. A little more off the beaten track is S'Enclusa, which has a 120m stretch of sand. To the west is the hamlet of Na Macaret, well sheltered from the wind, and further on is a lovely spot with its small sandy beach and several restaurants. Macar de sa Llosa, offering beautiful sands and dunes, is best accessed from Son Parc and Arenal de Son Saura. Also close by is Son Parc with its pretty, large white sandy beach surrounded by pine trees and sand dunes. This beach also has warm shallow waters, a beach bar and water sports. The resort has a choice of restaurants, small shops and a supermarket. Son Parc also has tennis courts and is home to Menorca's only 18-hole golf course with a clubhouse bar and restaurant overlooking the course. A short drive away is Fornells, with its beautiful harbour front, shops, banks, bars and high quality restaurants. As you walk along the palm-tree line promenade there are clusters of quality restaurants and bars opposite the sea wall and Fornells is the home of the well-known culinary delight 'Caldereta de Langosta' (Lobster soup). 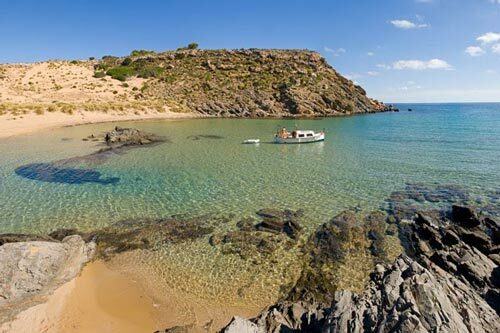 Fornells is a beautiful part of the island and the natural bay is approximately 4km long x 2km wide. One of the most popular activities within the bay is sailing and windsurfing. The capital Mahon and the airport are just a 25 minute drive from Addaia. View villas in Port Addaia here.